In my fantasy world, every learner who takes one of my courses would be tech savvy; and I'd be able to try lots of cool new things to keep them interested. The truth is, we all bring our own experiences to the table, and there will be always be learners who are tech-challenged and might need a little extra guidance. As an instructional designer, I don't want to leave any students out in the cold. That being said, I'll share some simple tips to help make all your courses user-friendly for all learners. 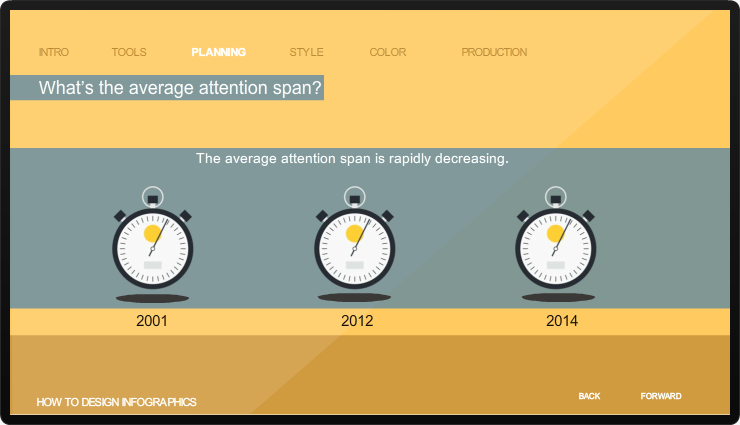 Using the same color buttons and hyperlinks makes it easy to engage with the content. Keep NEXT and PREVIOUS buttons in the same location--help your learner become familiar with the process and get comfortable with online learning. Consistency is also key when it comes to voice. If you ask a learner to perform a task, make it clear what the task is and that they are to perform it. If you are demoing a process to the learner and they are NOT to interact with the content, but just watch the demo, make sure that it's clear to the learner as well. I've seen courses that mix the two techniques without proper definition and clarity. That can be confusing, and the learner can miss important content. In the example above, I have included a direction to "select each stopwatch." This simple directive establishes that the learner is to interact with the content. 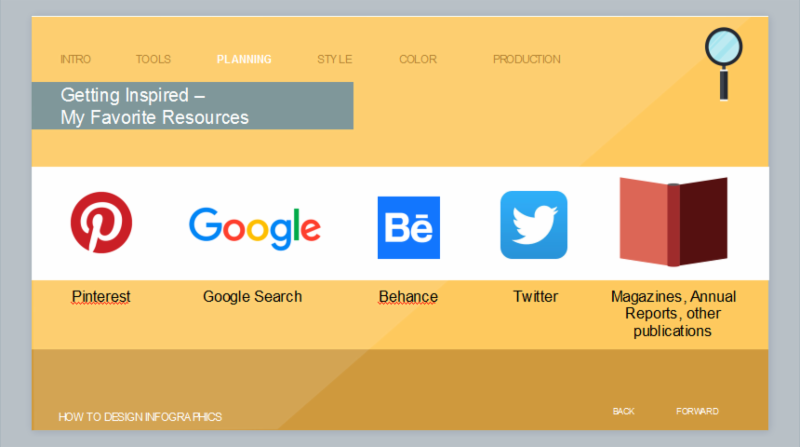 Regardless of whether you use the navigation features of the tool you are creating in, or create your own custom navigation, just make sure you cover all your bases. A learner may wish to return to the first scene, provided you allow them to do it. Make sure you give them an easy way to get back there. Navigation or "nav bars" are very familiar to most learners, since websites have similar navigation and your users are most likely accustomed to using them. If you're "branching" within your course, ensure the learner can always find their way around if they move through the course in a non-linear fashion. This graphic shows some of the aforementioned tips to make it easy for all learners to interact with my content, just as I intended. 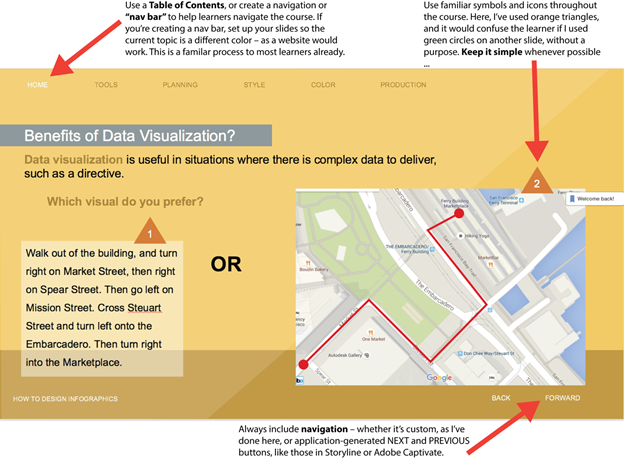 Another tip for guiding the learner is to keep all the navigation in the same look and feel. Text links would be the same color as buttons, and so on. Again, it becomes familiar to the learner and removes any intimidation about interacting with the course. 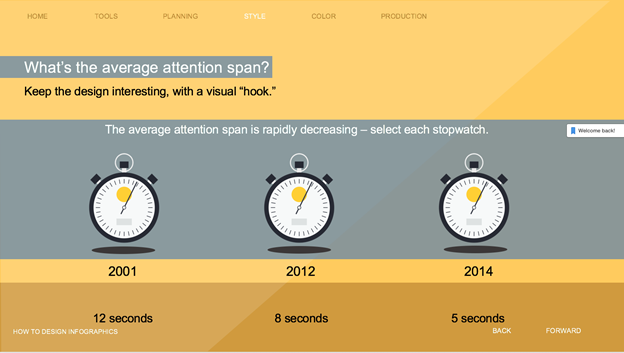 Here's an example of using one color to indicate interaction. Notice the orange buttons onscreen, as well as the orange NEXT and PREVIOUS. They don't look alike but are the same color, so by now the learner is accustomed to interacting with the orange directives. If you've recorded the screen with Articulate Storyline and elected to insert View mode steps, it's ikely that you'll need to modify the behavior of the cursor that gets created automatically on every slide. Fortunately, there are several cursor formatting options available. Open a slide containing a cursor and double-click the cursor to display the Mouse Tools tab on the Ribbon. 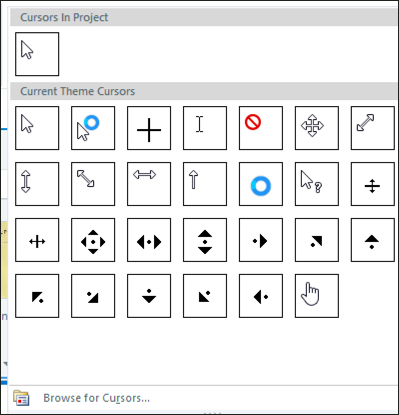 Next you'll find the Cursors group where you can quickly change the appearance of the cursor (really useful if, during the recording process, the cursor your system displayed wasn't the one Storyline chose for you). Not finding the Cursor you need? no worries. Click the arrow at the bottom right of the group to expand the group. From there you'll find additional cursors along with an option to Browse for Cursors (you can load any cursor file on your computer or network). You can use the Path group to perform such cursor trickery as changing the Pointer Path from curved to straight (curved is the default and is ideal), slowing down the cursor speed, hiding or showing the click effect, and changing the direction used by the cursor as it approaches a target. Last but not least, if all of the Path options above weren't enough, you can always manually drag the cursor around the slide and make it bend to your will (as it were). Looking for Articulate Storyline or Adobe Captivate training? Check out these live, online classes. Creating engagement with your learners greatly increases their retention of the information and makes the course that much more enjoyable. I often use the word "fun" when I describe eLearning--we're not talking balloons and unicorns here. But I want the course to be easy to navigate, thought-provoking, and an all-around pleasant experience for the learner. Here are some easy ways to add interaction to your eLearning courses. I am using Articulate Storyline in my examples below, but these principles will work with any eLearning application. 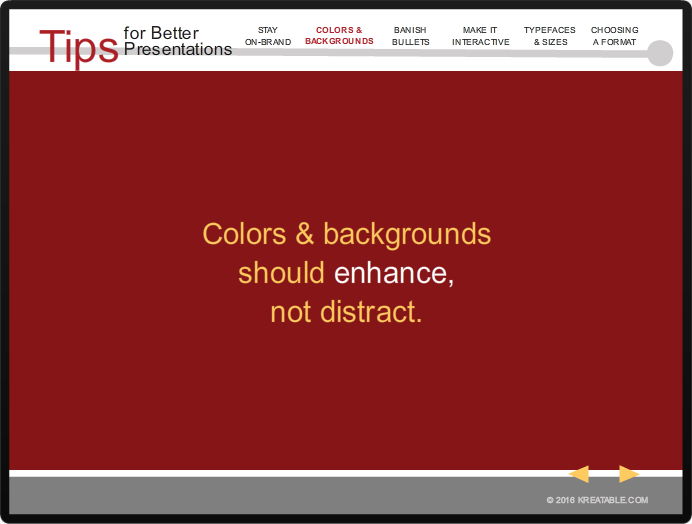 Instead of using the default menu or TOC in your courses, add a Navigation Bar to the slides for a clean, professional look. Learners can access other sections easily. 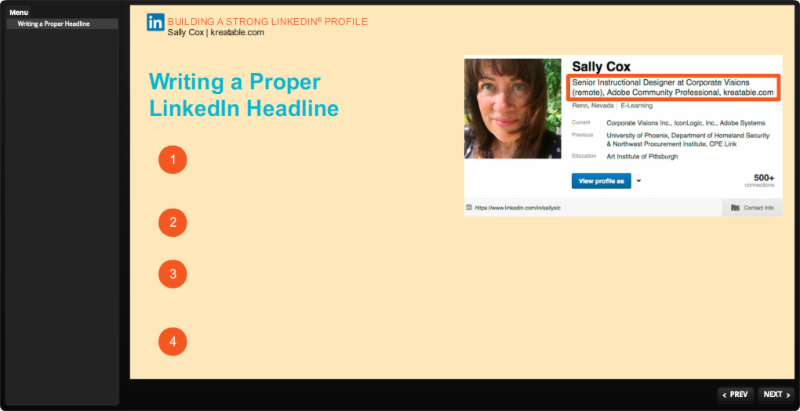 You can even lock down more advanced topics until the learner visits specific content. A navigation bar was added to the top of the slides. The learner can access another section easily and it resembles a website so it's familiar to most. I changed the color of the topic in the navigation bar and made it bold to stand out and to show the learner which section they are in--again, like a website. This technique is easy to understand and navigate. Give the learner a task. Ask them to answer a simple question--not a graded question in this case but a "survey" question. You can have different comments pop-up depending on how the learner answers. For example, if the answer is flat out wrong, you would say "Great guess, but let's take a look at why that might not be the best answer in this scenario." 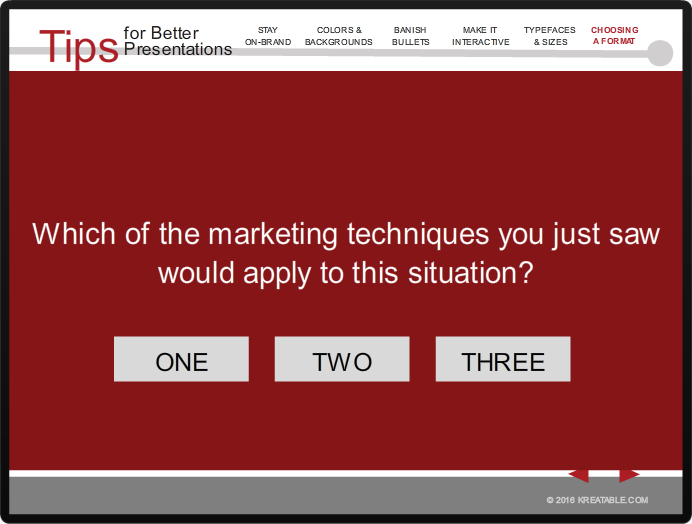 Or, as I often do, set up all the answer buttons to proceed to the next slide. In this case, it doesn't matter what the learner chose as the answer, they are about to find out what the right answer is. But you made them think, and that's engagement! In the example above I added a simple question. Regardless of their answer, the learner is taken to the next slide to learn the correct answer. I say work, but what I really mean is "make them interact with it." Instead of displaying all the content on the slide, why not give the learner a task? Add buttons or icons that, if clicked, display the information. In this course the learner has already been interacting with the orange circle on previous slides so they know to tap a circle to get information. This is a simple but effective way to add engagement. In the example above I used different shapes but it's the same concept. I used icons for the learner to interact with and gain information. And finally, the use of a familiar symbol--such as a lightbulb, question mark, or magnifying glass--can allow you to give the learner a tip or tidbit of useful content. Some courses use the question mark as a "help" link or to give more info about how to navigate the course. The lightbulb can be used to share a timesaving tip. And the magnifying glass is a great choice if you are giving them more detail or diving a little deeper on the topic. I used a magnifying glass to share more information with the learner. By keeping it consistently in the same location, the learner becomes accustomed to interacting with it. 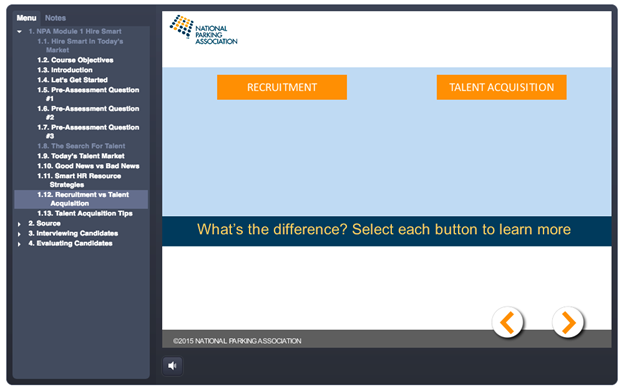 Get a Jump-Start On Mastering This Awesome eLearning Development Tool! If you're looking to learn Adobe Captivate... and quickly... this beginner course is for you. During the 6 chapters that make up this course you'll learn how to create a soft-skills lesson from scratch. 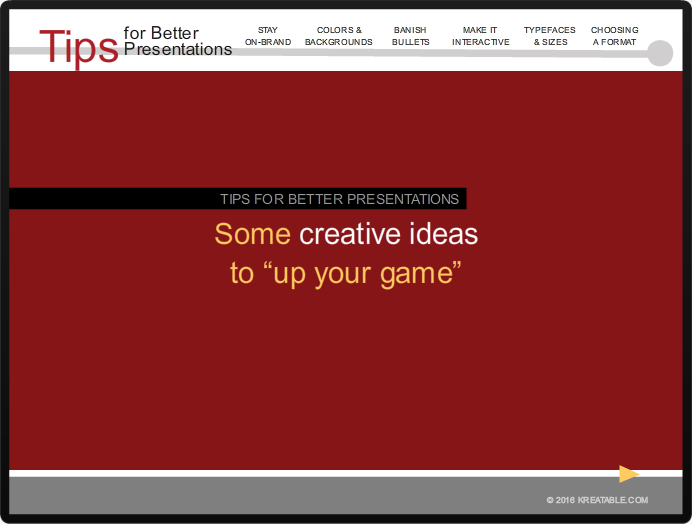 The lesson will include adding slides, applying themes, adding images and text, and adding interactive buttons. You'll learn how to publish your eLearning content for the widest possible audience. Learn to publish SWF, HTML5, or both... and why. Curious how to create software simulations? This course has you covered. You'll learn how to create both software demonstrations and highly interactive software simulations... and in multiple languages. And you'll learn how control slide and object timing, and how to work with and edit object styles. All this, and you'll be able to work through all of the lessons in just a few hours. 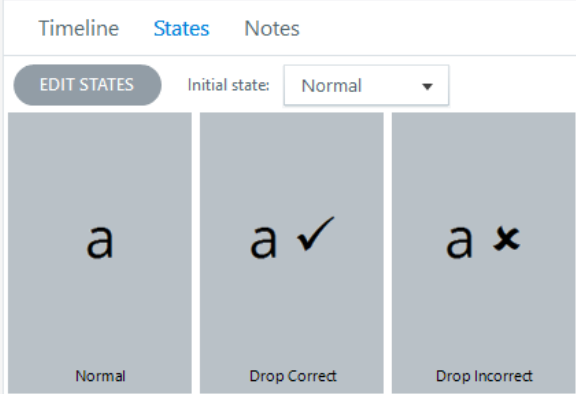 Perhaps you're already familiar with states in Articulate Storyline such as normal, hover, down, visited, hidden, and disabled, but not quite acquainted or aware of two additional object states known as "Drop Correct" and "Drop Incorrect." Let's discuss where, how, and when to take advantage of these states. First, understand that these states are most useful when you have a "drag and drop" interaction (either as part of a Freeform Quiz slide or in a regular slide that includes a "Object Drop Over" or "Object Drop On" event (When)). Second, you need to define the "Drop Correct" and "Drop Incorrect" states in the states panel for the objects you need to make "draggable" or "droppable". Maybe you can include a visual clue (an icon or symbol) that represent a correct or incorrect appearance of the element after it has been dragged and dropped. To take advantage of the newly created "Drop Correct" and "Drop Incorrect," you need to have a "drag and drop" interaction either in a quiz slide or in a normal slide. In a Freeform Quiz Slide, the states are automatically triggered when an interaction is submitted. Let's take a look at a normal slide interaction example. In the interaction represented in the figure below, each letter object has been defined a "Drop Correct" and "Drop Incorrect" states. In addition to the "draggable" letters. 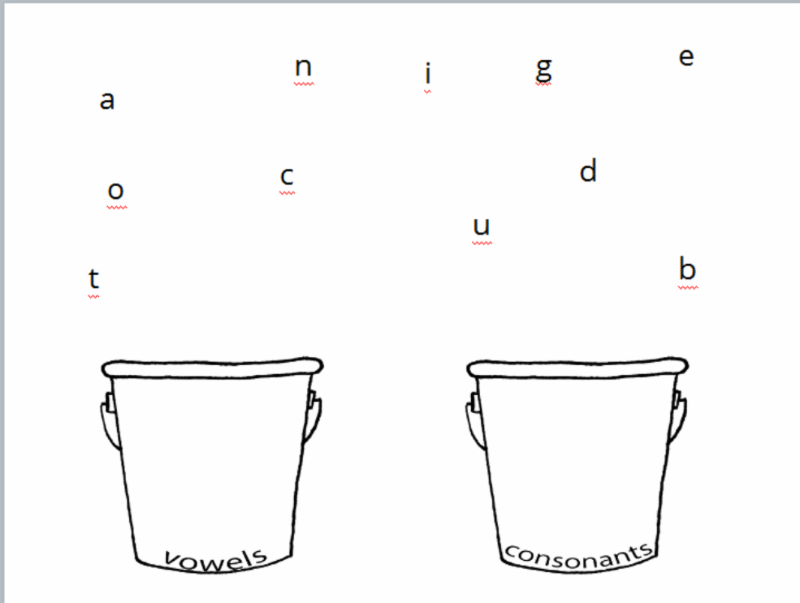 There are two targets (the buckets) where the letter can be dropped. 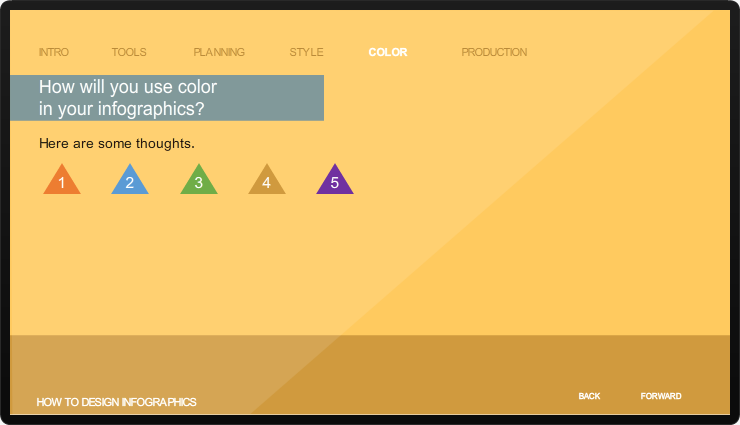 Finally, preview the slide to test the interaction. During my live, online Adobe Captivate classes, I teach students how to use Captivate's Text to Speech feature. I look forward to teaching this particular feature because it honestly gets everyone in the room pumped up. And why not? 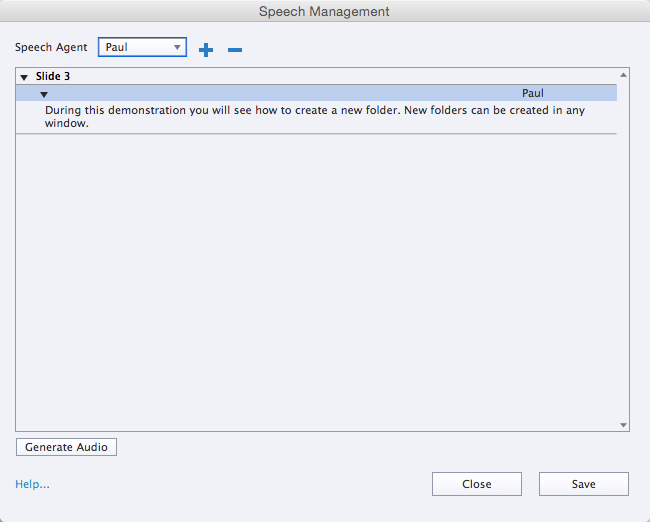 Text to Speech is an easy-to-use utility that will instantly convert written text into audio files. All you have to do is type a slide note, select the note, click a check box, click the Text-to-Speech button, select a "speech agent," and click Generate Audio. 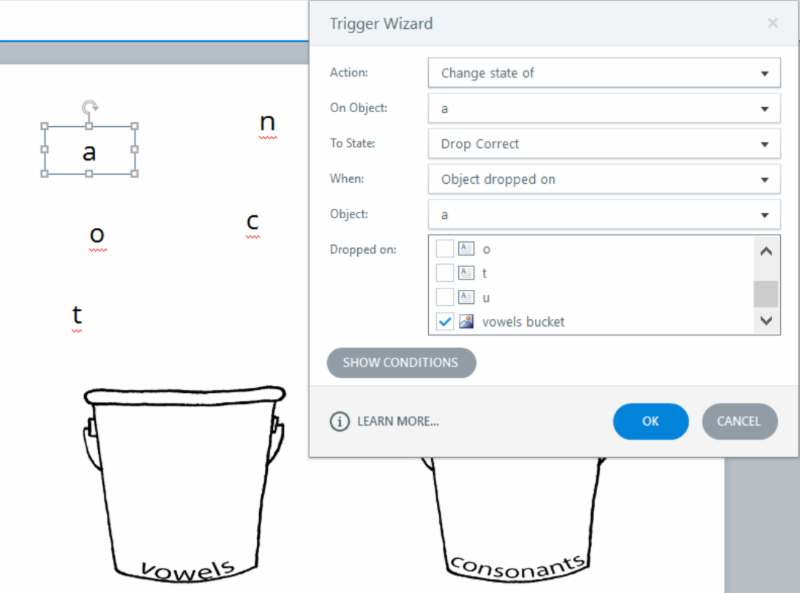 However, if you've spent any time with Captivate's Text to Speech utility, you have probably discovered that the pronunciation of the spoken words isn't always perfect. 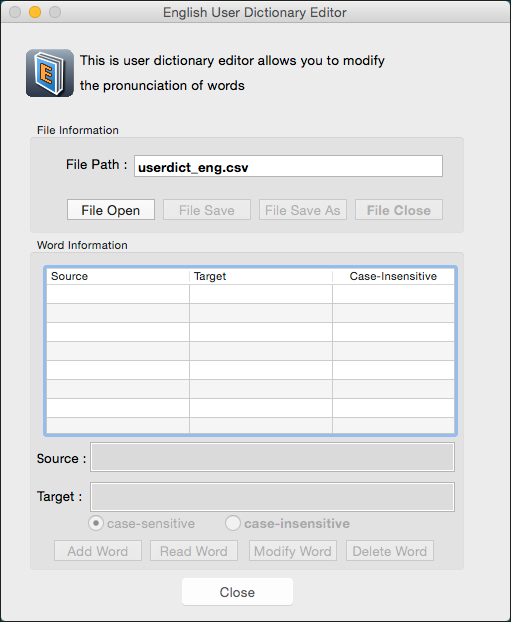 Unfortunately, if you don't like it, there isn't a pronunciation editor in Captivate that will help, so you're stuck. Bummer! The end! Have a nice day. Oh, you were looking for solutions here? In that case, read on. 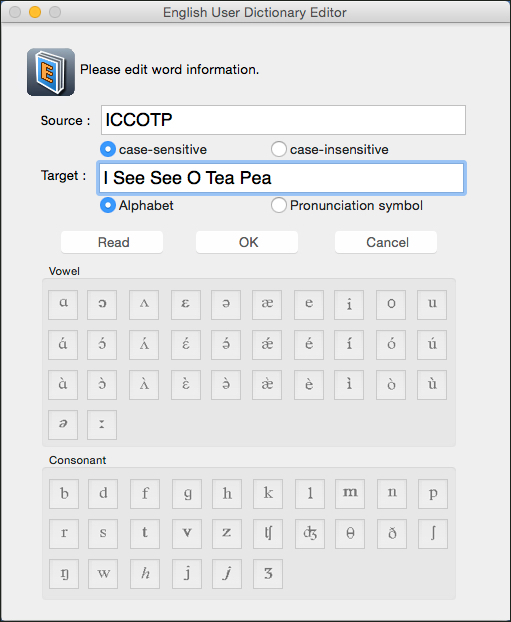 Believe it or not, there is actually a pronunciation editor for the Text to Speech utility called UserDicEng. It's not part of the Captivate interface and you aren't likely to stumble upon it accidentally. If you have installed Captivate and the Adobe Captivate Voices, you'll typically find the tool in the following location: Program Files (Windows) or Applications folder (Mac) > Adobe Captivate Voices > VT > The Agents Name > M16 > bin > UserDicEng (app or exe depending on your platform). After opening UserDicEng, click the File Open button and open userdict_eng.csv. At the bottom of the dialog box, click Add Word. 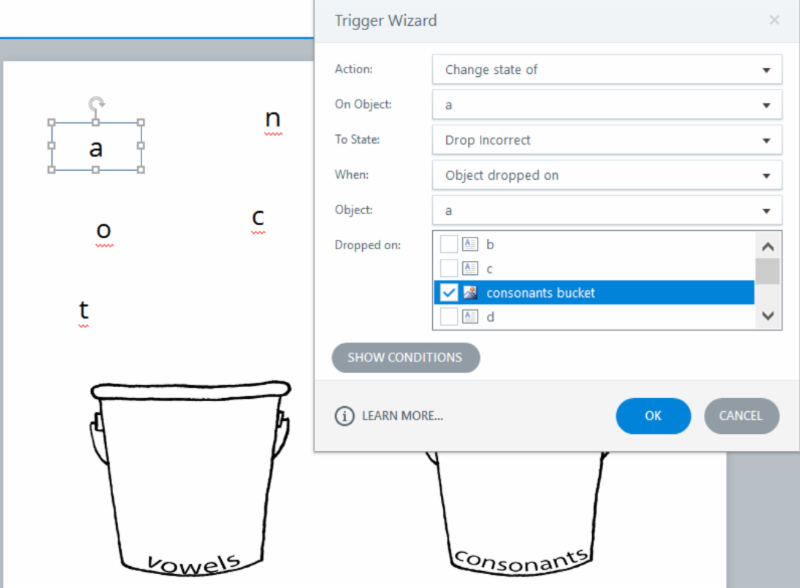 Type the original word into the Source field and then type the correct word into the Target field using the correct pronunciation (using the letters or the Pronunciation symbols). You can always click Read to hear the pronunciation of the new target word. When finished, click the OK button. Click the File Save button followed by the Close button and you're done. 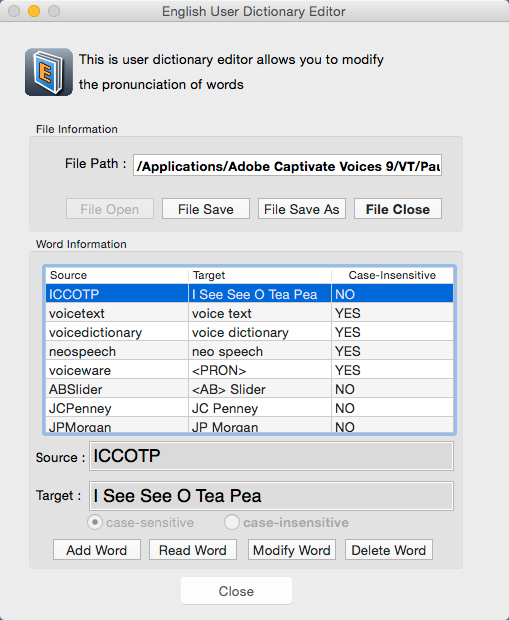 The new pronunciation will be used by your Speech Agent within Captivate the next time you convert text to speech. OK. I have tried not to be judgy. I have tried to be understanding and forgiving about people's little language quirks and failings. But the following advertisement in a magazine sent me over the top. The [name withheld to protect the offender] is a scientifically validated assessment that generates over one million profiles of personality type, taking a deep look into personality in one's natural state and how one behaves in their profession, at home, or socially. The [name withheld] then measures how one leverages psychological resources to be adaptable and flexible to everyday situations leading to coaching and development opportunities. Seriously. You spent hundreds, possibly thousands of dollars to run an ad, and you spent zero ($0.00) on copyediting the ad for grammatical errors--and even less (even though that is not possible) on making the content of your very expensive two sentences make any sense. Wait, it IS possible to spend less than $0 on clarity, because apparently you spent money to go in the opposite direction: to complexify (yes, I had to coin a term to describe what you did) and obfuscate your content in a misguided attempt to make it sound like more of a big deal than it is. First, you inflated the language in meaningless ways: Instead of the clear, straightforward phrase "Over one million personality profiles" you beefed it up to say "profiles of personality type," and ran straight into mismatching the plural profiles with the singular personality type. Then, in a mistaken effort to make your language generic, you mismatched personality with one's, and then further mismatched that with the possessive pronoun their. Next, your instrument apparently measures how "one" (which actually means "anyone," but you use as though it means the particular individual whose personality is being measured) "leverages" (because heaven forfend we use a clear and meaningful word like use when a hot piece of jargon can be gratuitously thrown in) "psychological resources" (because apparently now even our own internal psychological strengths and capabilities are now commodities that can be marketed and exploited like any other "resource"). Dangling participle: what does "leading" modify? Check out Jennie's eLearning writing classes and ensure both your voiceover scripts and eLearning scripts are ready for prime time!